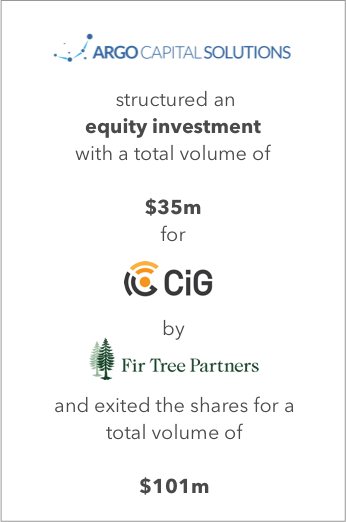 In 2013 Argo Venture´s capital markets subsidiary Argo Capital Solutions structured an equity investment with an overall volume of $ 35 m for CIG Wireless Corp (CIG) by Fir Tree Partners. The New York-based private US $ 10 bn investment fund exited the shares in 2015 for an aggregate volume of $ 149 m, returning a net profit of US $ 90 m within only two years of the investment. 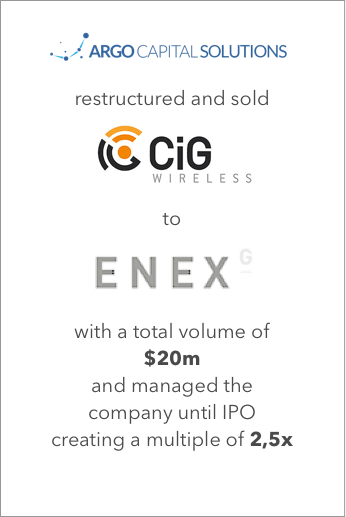 CIG Wireless, which was initiated by Stefan Beiten and Nikolaus Weil, specializes in managing cell towers and leasing antenna space to wireless carriers completed the preferred stock financing deal with the aim to generate sufficient funds to complete the acquisitions of Southern Tower Antenna Rental and Liberty Towers and support CIG’s overall growth. This move also benefitted its subsidiary CIG and in turn the German investors of the InfraTrust funds between 2007 and 2010. 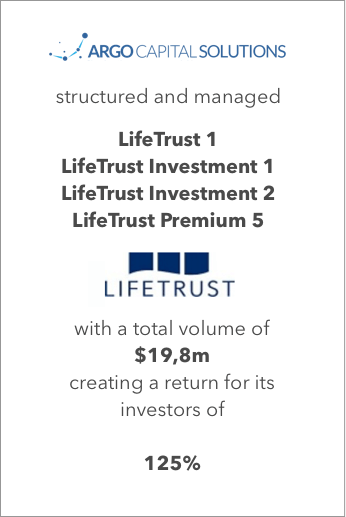 CIG, LLC operated as the asset manager of said funds whose management welcomed the strengthening of their US market position as a result of Fir Tree’s investment. 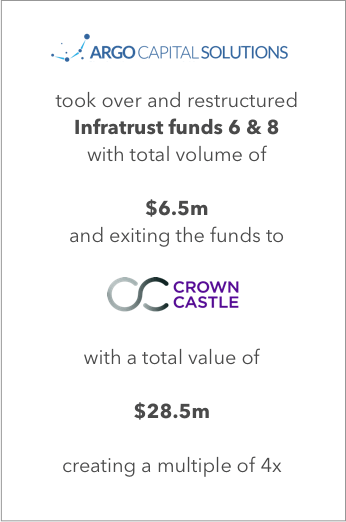 At the time of CIG’s takeover by privately owned real estate investment trust Vertical Bridge in 2015, the former’s tower portfolio had grown to more than 200 geographically widespread tower sites. 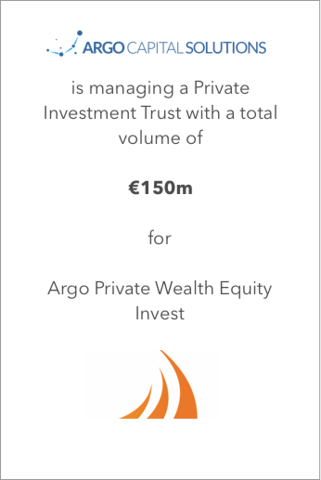 Both Beiten and Weil are key figures at Argo Venture Capital and its various subsidiaries and associated companies such as client and portfolio company Berlin Atlantic Group and independent film production outfit Greenlight Media. The lawyers and habitual entrepreneurs specialize in developing innovative financial strategies and products while taking advantage of new business opportunities. Our seasoned financial advisory team excels at raising, structuring and implementing fund vehicles tailored to your requirements and expectations. Wherever you are. Contact us to learn more.